Because Each One Has a Different Need or Ability? If you're struggling with a "one-size-fits-all" activity program, then you may not be meeting the individual needs of your residents. Learn how to find appropriate activities that meet the needs of all your residents! After signing up for our free activity tips, check out our how-to articles for helpful tips on providing fun activities for all your residents. 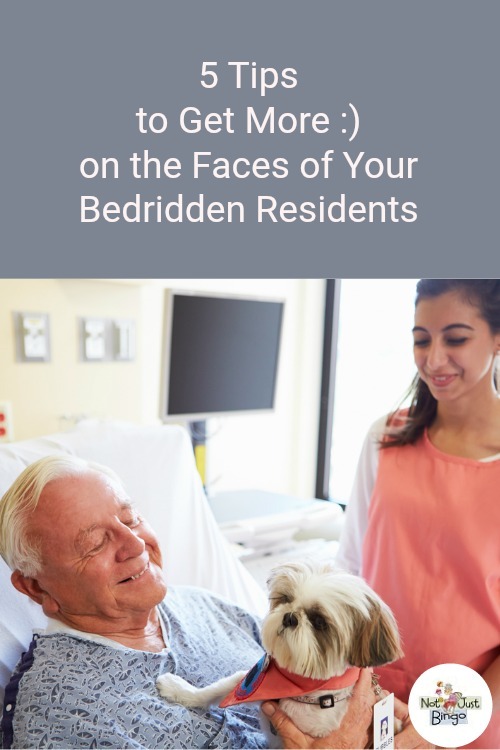 For example, read one of our articles to discover How to Get More Smiles on the Faces of Your Bedridden Residents, which explains how to include your bedridden residents in your main activities. In addition, read the article How to Offer Both High- and Low-Functioning Activities to Residents of Different Levels, which provides tips on how to meet the needs of all your residents during one activity. Next, use our Observance Calendars to find unique daily, weekly, and monthly observances and holidays that you can use as inspiration to create your activities that meet the needs of all your residents. For instance, celebrate May Day (May 1) with all your residents by having them work with real flowers. Have your higher-functioning residents use flowers to make floral arrangements, while having your lower-functioning residents use flowers to make potpourri by picking off the petals – all in the same room, and at the same time! Finally, gather a few more fun ideas that you can easily plug into your monthly activity calendars by checking out the Not Just Bingo membership, where you can access hundreds of fun activities each month and every month! Find activities that meet a variety of interests and cognitive abilities that are right for your residents and their individual needs.